Katie Taylor was born and raised in Ocean City, Maryland. She attended Gettysburg College, where she was Captain of the Women's Tennis Team and received an All-Centennial Conference Singles Award. 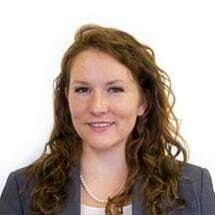 Katie then graduated with honors from the University of Maine School of Law after serving on the Maine Law Review and in the Cumberland Legal Aid Clinic. Prior to coming to Virginia, Katie practiced family law, criminal law, and did a significant amount of appellate work in Portland, Maine. Most recently, Katie practiced at the Pulaski Public Defender's Office where she represented indigent clients charged with misdemeanor and felony offenses. When not practicing law, Katie enjoys playing tennis, hiking in the Roanoke Valley, and watching football.